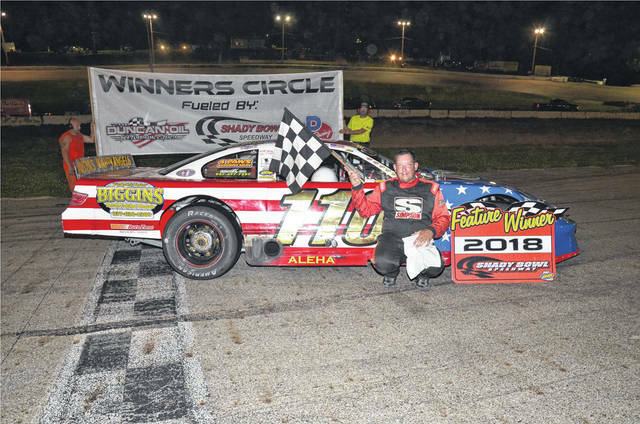 DeGRAFF — Jim Lewis Jr. of Fairborn notched his first late model feature win of 2018 on Saturday at Shady Bowl Speedway. Lewis has run strong all season, but had no feature wins going into Saturday’s 40-lapper. Lewis, behind the wheel of his Shatto Racing owned car, took advantage of his front row start to take the lead on lap one. Lewis set a blistering pace in his Biggins Small Engine Repair backed ride. Josh Smith made his way through to set the stage for a great battle with Lewis. Smith has four feature wins this season and had his sights set on number five. The pair battled in a race that had fans on their feet. Smith was actually shown as the leader on lap 24, but Lewis regained the lead on the next lap. He led the rest of the race to claim the Dave Nagel Excavating series win. Smith held on for second, with fast qualifier Mike Ward third. Nic Burnside was fourth, with dash winner Don Mahaffey Jr. fifth. Lewis also claimed the heat win. The 25-lap street stock feature was a real barn burner with action on every lap. Rob Schaeff took the lead at the start in his Roger Winget Race Cars Chevy. The Piqua driver showed he was the class of the field, as he led all the way. Buck Purtee, fast qualifier Josh Sage, Rodney Roush and Jacob Muncy rounded out the top five. Muncy carried the checkered for the dash, with Schaeff and Jacob Heckman taking heat wins. Sage picked up the DeGraff Service Center Hard Charger Award. Who can beat Jason Purtee is the question in the Hanger 18 Race Cars Hobby Stocks. Purtee was fast qualifier and won his fifth feature of the season in his Fat Boys Pizza Ford. Steve Fowler, Les Rhodes and Travis Fogt chased Purtee across the line. Purtee won the X-Factor Racing Hard Charger Award. The Indiana-based Thunder Roadsters made their Shady Bowl debut. The open-wheelers put on a great show, with Dave Osborne of Indianapolis winning the 20-lap feature. Osborne is sponsored by Sam Pierce Cheverolet. Fast qualifier Doug Dooger was second, with Chad Corey, Clayton Gaines, and Greg Corey rounding out the top five. Gaines was the winner of the heat race. This Saturday, Shady Bowl will host the Neal Sceva Memorial for the Street Stocks and the Denny Shatto Memorial will be for the Late Models. The Buckeye FWD Mini Stocks will compete in the Summertime Shootout, a 100-lap for the front wheel drive racers. The Biggins Small Engine Repair Modifieds will also be on the schedule. Racing will start at 7 p.m.